Party Ideas by Mardi Gras Outlet: Crab Season...Time for a Boil! 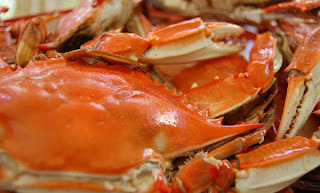 My favorite Louisiana seafood, CRAB, is in season right now. 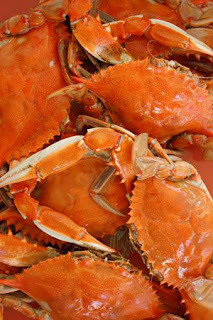 There is nothing more delicious than hot boiled crabs right out of the boiling pot. This weekend, we enjoyed this batch of boiled blue crabs that were thick with white lump crab meat (the crabs turn red when cooked.) I am getting hungry just thinking about them. If you are lucky enough to live in an area that you can find fresh boiled crabs, I suggest you get some soon before the season ends. The sweet crab meat is definitely worth the time and work involved to peel them. I hope you get to enjoy some! With Crab Boil on my mind, I thought I would share a few of the crab products we carry at Mardi Gras Outlet. I love theme parties! Bringing the crab theme into all aspects of the event, really make the event special. So here are some creative ideas to use if you are having a crab boil! Just arrived, this week are these fun three-dimensional red crab soaps. Individually wrapped and costing only $1.40 each, I think they are a great deal! These crab soaps would be perfect wedding favors for a beach wedding or cute in guest bags. Pile these cute crab soaps up in a basket in a bathroom mixed with fresh sliced lemons for a seafood or crab boil. Use the lemon and soap combination to take the seafood smell off your hands. This fun Bobblebead Crab Necklace has claws and legs attached with bouncy springs that allow them to move. This fun party bead/necklace is sure to get some attention, as it bounces around. Beads are great to hand out to your guests or to decorate with. Add these bead necklaces to a plain wreath for an instant crab theme wreath. Wrap beads around a vase with the bouncy crabs dangling. Fill vase with coordinating flowers for a festive centerpiece. Scatter bead necklaces around the party tables, for guest to enjoy, wear and take home. Kids love these bobbling creatures! We sell Bobble picks, magnets and beads in both this comic crab and a realistic crab. Coordinate your decorations and party favors with these fun bobble crabs! Tika Hasslock's beautiful Seafood Buffet Platters create a wonderful presentation for boiled seafood. The lively colors and three-dimensional accents on the platters are perfect for a spicy crab boil. This Tika Designs Oval Seafood Platter is painted with shrimp, red crab, sliced yellow lemons and Tabasco bottle. It has a raised garlic accent on the blue rim of the plate. This 13.5" oval platter is good size for crabs. Larger platters, assorted serving pieces and dinnerware are available also. Don't forget these disposable paper trays for seafood boils. These molded fiber trays make serving and clean-up at a crab or seafood boil a breeze. For these products and more crab themed products, click here!